All prices are in USD. If you do not wish to pay by credit card, please contact Eagle Spirit Ministry to discuss alternative payment options. 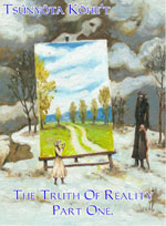 The Truth Of Reality is the collection of the insights and awareness which Tsúnyöta Köhe't gained throughout his journey. Paperback cost $16.00 (plus air mail shipping & handling). Cost of insurance is included. Alternatively you may wish to use Pay Pal. The work of Tsúnyöta Köhe't is freely available, and will remain freely available on this website. However, following a number of requests, Eagle Spirit Ministry has begun publishing The Work Of Tsúnyöta Köhe't in hard copy. The cost of the books, reflects the cost of publication, and the various printing, binding and design costs which are necessary for publication. The knowledge within the books is free. The books are distributed by our friends and supporters, Allsorts & Oddbods, through their secure checkout facilities.